Micromax A54 Ninja 3.5 Smarty is the device from Micromax that comes with very attractive price and specs too . Micromax Ninja3.5 Smarty runs on 1GHZ Qualcomm 7225AA Chipset .Micromax A54 Ninja-3.5 runs on Google’ Android Os 2.3.5 (gingerbread ) . The device has DUAL SIM capability , one 3g and one 2g SIM .Micromax A 54 looks much premium that it actually is . 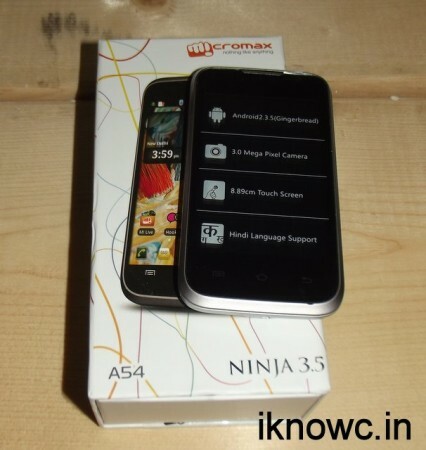 Micromax A 54 Ninja-3.5 looks more stylish and expensive then it actually is . 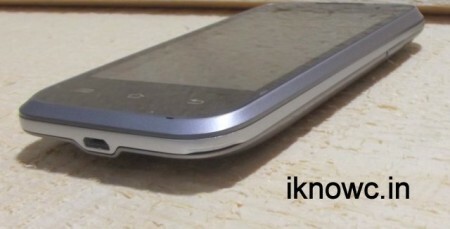 Micromax A-54 have round edges , which makes it look like slim . At the front of the device there is 3.5inch capacitive display having resolution of 320×480 pixels & colour depth of 262k . There are three touch sensitive buttons at bottom of the device & if you are beginner to android then these buttons makes Micromax A54 more approachable to you . At the bottom there is micro usb port for charging as well as for connecting your device to pc . Volume rocker is placed at left side & power button is placed at the right of Micromax A54 ninja3.5 . At the top of Micromax A54 there is jack for handsfree & camera and loudspeaker are placed at the rear of the A54 . Back panel / cover of Micromax A54 is made up of plastic but looks like aluminum ( silver colour ) . Micromax A54 has 3.5 inch (8.89 cm) capacitive touch screen having resolution 320×480 & colour depth of 262k . Touch response from the device is good . Display of Micromax A54 is bright and sharp . Colour reproduction on the device is ok . Micromax A54 comes with 3.0 MP FF camera . Camera interface of the device is very easy to use and is approachable . You can record video upto 640 x 480 resolution & you have many options to select , as you can select format of the video . The camera of the device is ok ( – not too good not too bad -) & colours are dark . 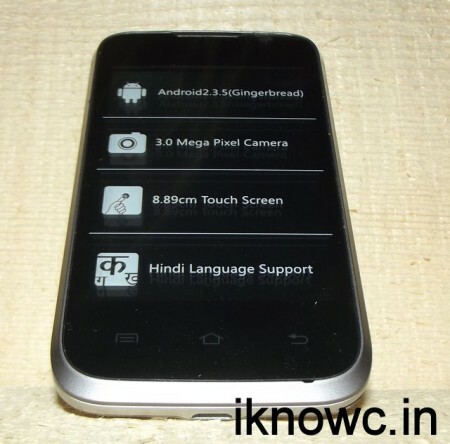 Micromax A54 Ninja-3.5 runs on Android 2.3.5 which is Running on the most of the android handset . The Android 2.3.5 user interface of the device makes device approachable . Micromax did some customization in the device UI as they added there MI apps , added time and whether notification widget . You can do quick setting by scrolling down the notification panel . Micromax A54 Ninja 3.5 gives us nice result is we talk about its performance . We didn’t find any lag from the device till now ( as we are testing the device- so full confirmed details will be uploaded in full review of MICROMAX A54 ) . The performance is much better than Micromax A57 Ninja3 . Micromax Ninja-3.5 has 256 MB of RAM and 512MB of ROM (130 MB is free for apps) .We will update the benchmark and Other test for performance in our full review . Micromax A54 is 1GHZ single core device that comes at budget price . Micromax A54 runs on Android 2.3.5 gingerbread . The device has 3.5 inch display of 320×480 resolution . A54 Ninja 3.5 has DUAL SIM capability and Connectivity like – 3G , 2G , wifi802.11b/g/n , USB 2.0 . The device Does have motion Sensor . 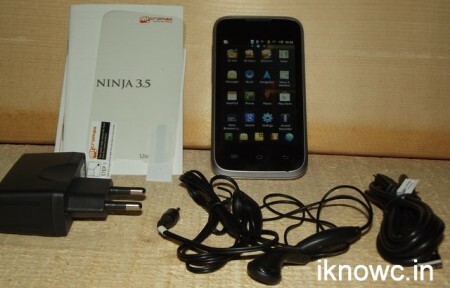 Micromax ninja3.5 box pack includes – Handset , Battery , User manuals , Handsfree , USB cable , Charger and SCREEN PROTECTOR . A54 NINJA 3.5 box pack comes with a screen protector but there is already a screen protector on the device , which is nice – means you no need to buy it from market place . Ninja3.5 A54 has a battery of 1300mAH which Claims the Talk Time of 4hours and Talktime of 170 hrs . We own tested the Battery and it gives us very decent results . The time when we unboxed the device the battery was 50% after that we use the device for 2 hours did some calls and used wifi as hotspot for 1/2 hour and after 24 hours the battery charge left is 30% , which is nice . Karbonn A6 comes with 1ghz processor and price of RS 5390 . Karbonn A6 has IPS screen of 4 inch having 800×480 pixels resolution. 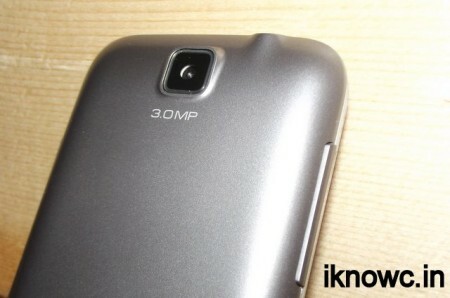 The handset runs on the android ICS ver 4.0 anfd has 5.0MP camera and VGA at the FRONT . Karbonn a6 has nice feature than Micromax A54 Ninja3. Smarty 3.5. Micromax Ninja3.5 A54 is nice device At the price of Rs 4700 . The device runs on Qualcomm 7225AA Chipset of 1GHZ frequency . If you are looking for the device Under Rs 5000 – 6000 ,then Ninja 3.5 would be a great buy . Micromax A54 is Also known As Ninja3.5 and Smarty 3.5 . First install cwm recovery ,,,search it on xda... Then put the custom rom in sd card , boot in to recovery mod using volume up key and power key ...after that by using volume keys to scroll and power bt to select Install update by sd card then simply choose custom rom zip . Also wipe cache and data before installing the rom..... hope it helps you. is it possible to upgrade android version 2.3.5 to 4 in micromax A54? How do i upgrade Android 2.3.5 to 4 in Micromax A54 ? does this device is able to play games like temple run 2,oz and subway surfers. And What is benchmark of this phone from the app antutu benchmark...........? I am not be able to see menu icon on my micromax a-54 phone, how would i get back lost icon and why it happened ? which is best A57 or A54? Follow these steps for Hardware reset before going further : https://www.dtechy.com/factoryhardreset/how-to-factory-reset-android-tablet-forgot-password/. If it doesn't work then search for the official ROM download it in your SD card and flash it via Recovery.